TRACK RE-ENTRY – Must have an approved wristband for re-entry to event. BANNERS, FLAGS AND PENNANTS ARE THE PRIVATE PROPERTY OF GLEN HELEN – Removal of these items will be considered theft and punishable by law. 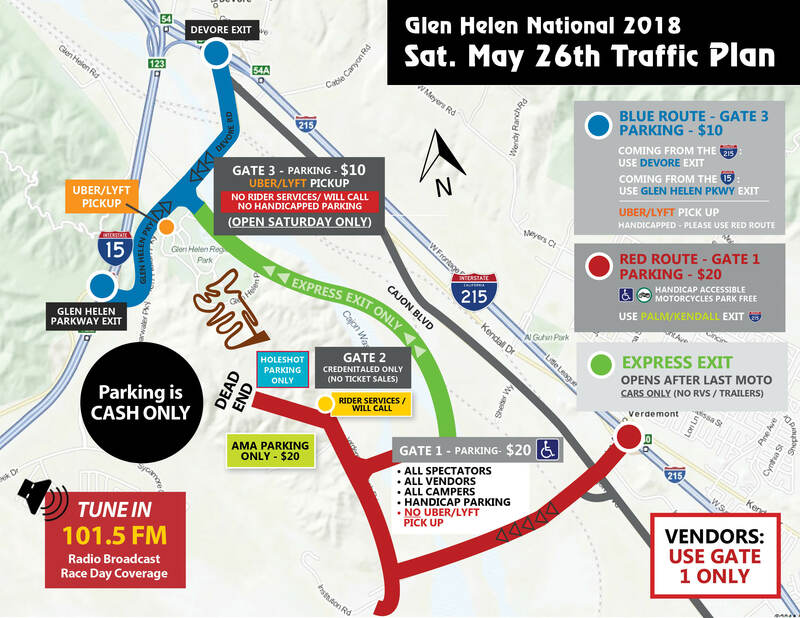 Below is some helpful information about race-day traffic and your parking options for the morning. Please click on the map to see a larger version. Where are the General Admission Gates Located? What ages are the child tickets? Child tickets are for ages 6-12. Children 5 and under are free. You Purchase Pit passes inside the facility at the Pit entrance. What is the official Glen Helen Hotel? Are we allowed to bring food/drinks? Yes. However, NO GLASS and NO ALCOHOL can be carried in. Yes, you can bring chairs. Can we bring an EZ-up? No, EZ-up’s are not allowed due to causing obstruction of viewing for other attendees. 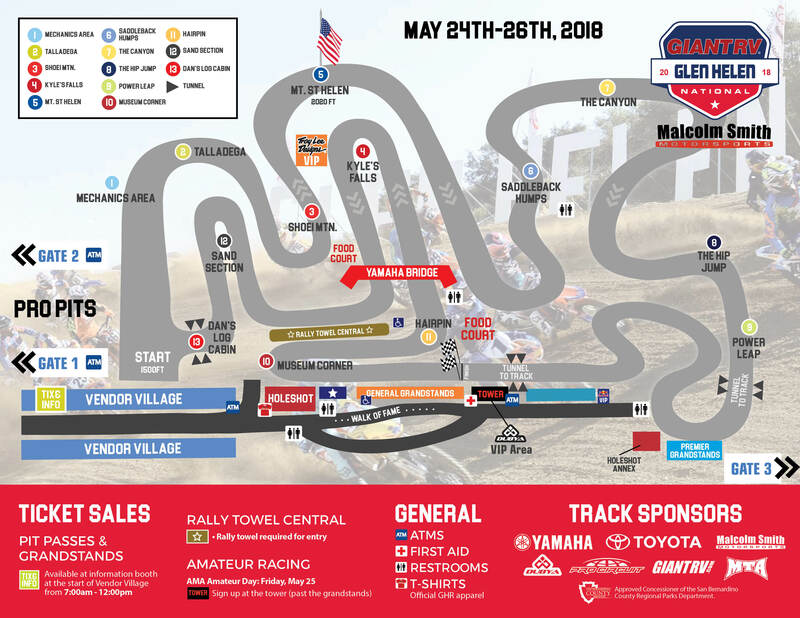 How can I listen to the Glen Helen National? You can listen to the race on 101.5 FM. My printer broke. Can I use my smart phone to redeem my online ticket? We urge fans to always print out their tickets and bring them to the event. Your phone may or not work depending on cellular reception. Do you have a handicapped viewing area? Yes. It is located by the 24-hour trophy. Do you have a sponsor’s village? Yes. It is located by the paddock entrance. Do you have food and beer vendors? Yes, there will be multiple food and beer vendors located throughout the racetrack facility. Do you allow early entry on Wednesday or Thursday? No – we do not allow any early entry on Wednesday or Thursday. 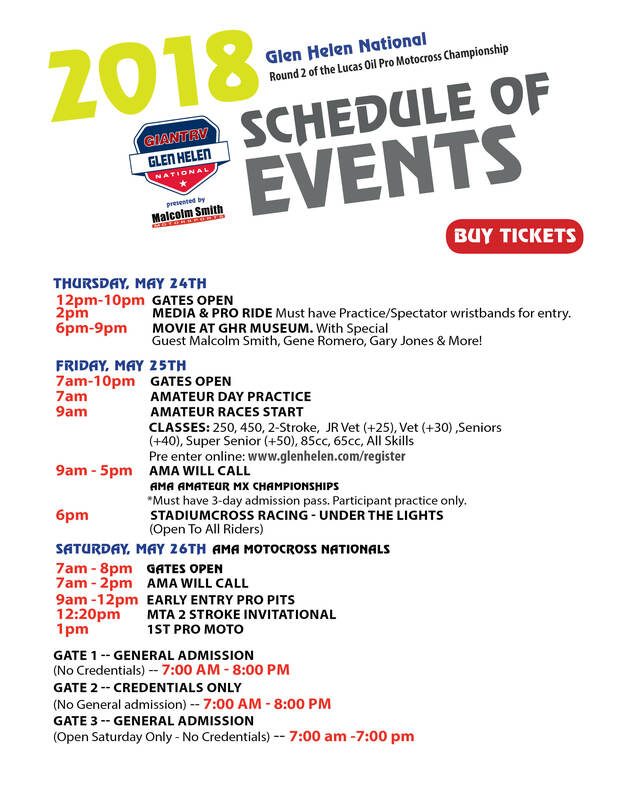 Can I purchase Paddock Passes on race day? And where? Yes, you can purchase them on race day just east of the paddock entrance gate.